6pk Oregon Mulching Blade Bush Hog FTH ATH 600 720 Finish Rotary Mowers 88668. Set of 6 Oregon Mulching Blade Replaces OEM Part Numbers: Bush Hog 88668. 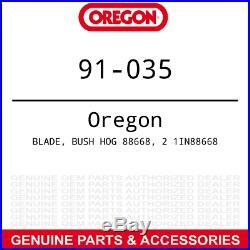 Genuine Oregon Product Replaces OEM Part Numbers: Bush Hog 88668. Fits: Bush Hog ATH600, ATH720, FTH, FTH600, FTH720. Superior mulching for bagging and discharge efficiency. Enhanced hardening to keep the blade sharper and more durable. The item "6pk Oregon Mulching Blade Bush Hog FTH ATH 600 720 Finish Rotary Mowers 88668" is in sale since Thursday, March 21, 2019. This item is in the category "Home & Garden\Yard, Garden & Outdoor Living\Lawn Mowers\Lawn Mower Parts & Accessories".